As translators we know that translating a text is never a piece of cake. According to Eric Jou however, the translation of Chinese games for the Western market is even more difficult as English and Chinese differ so dramatically in terms of word structure, culture and language use. Whether he is in Hong Kong or Tapei, Eric Jou has noticed that in China, there is an increase in the number of translated video games. The source language of these games varies but is predominantly English or Japanese; it thus appears that game developers are most definetly aiming for the vast Chinese gaming market. However, games made in China are introduced to the Western market as well. This is not simply a matter of producing more copies of the Chinese game and shipping them to Europe or America; in order to be sold on the western market, these games first have to be translated and localized. Josh Dryer, a Beijing-based game translator and localizer, claims that Chinese game companies have targeted the west for as long as they exist. ‘I often work for a Chinese gaming company itself or a western game operator who has a licensing agreement with a Chinese game company,’ Dryer says. ‘It’s not always clear who does the translation, sometimes there are third parties involved, such as big international translation houses.’ According to Dryer, translating Chinese games is very different from translating Chinese texts as next to translation, culturalization is required as well. Chinese-English translations are often restricted by the space available as English is a lengthier language than Chinese. The two Chinese characters 下载, for example, correspond to eight English characters. If these Chinese characters originally were on a web button, the English translation probably wouldn’t fit. Dryer states that budget is another constraining factor. 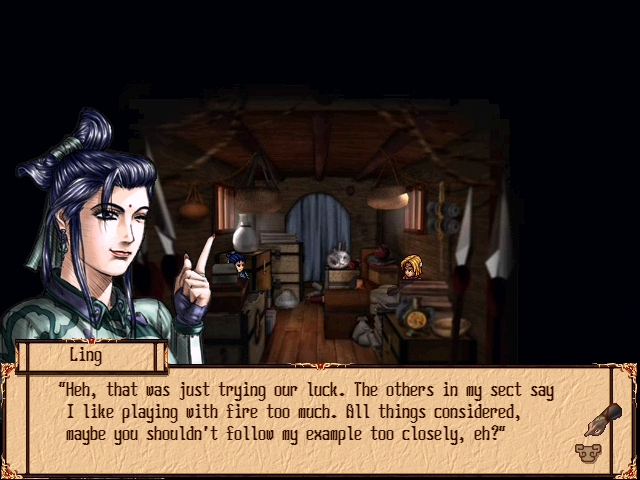 Previously, Chinese games were often translated by cheap, local university students with a major in English instead of professional localizers. In addition to the little time that was set aside for translation, this greatly influenced the quality of the translations. According to Dryer, translating Chinese into English is also hindered by the vagueness of the Chinese language. 找绿衣强盗, for example, roughly translates as ‘Find the green clothed bandit,’ but doesn’t state how many of these have to be found. However, Dryer believes these are all minor translation difficulties and says the real problems lie in the Chinese culture that is embedded in the type of game that is mostly produced in China, the ever so popular Massively Multiplayer Online Role-Playing Games (MMORPG). Before they can be introduced to the western world, the narrative of these martial arts fantasy based games such as the ‘Wuxia’ games or Age of Wushu often have to be altered. These difficulties do not mean Chinese game companies have brought their efforts to grow to a halt. According to Dryer, these companies have quite some money to spend and use this to tap into new markets as the Chinese one is already highly saturated with games. This is backed by recent studies that have shown that the Chinese have grown tired of Chinese games and they acquisition of western games by Chinese companies. The question that now arises is how many Chinese game companies will move westwards. Not that many Chinese games have been successful on the western market. In addition, it is not clear yet what audience the Chinese wish to target. The MMORPG market is already quite saturated with western games, so creating a gamer base for Chinese versions of this type of game might pose some problems. Whatever their ‘game plan’ 🙂 will be, Chinese companies will definitely pursue their efforts in expanding their markets. If they keep an eye on localization on the way, the Western world can prepare itself for some serious Asian competition.